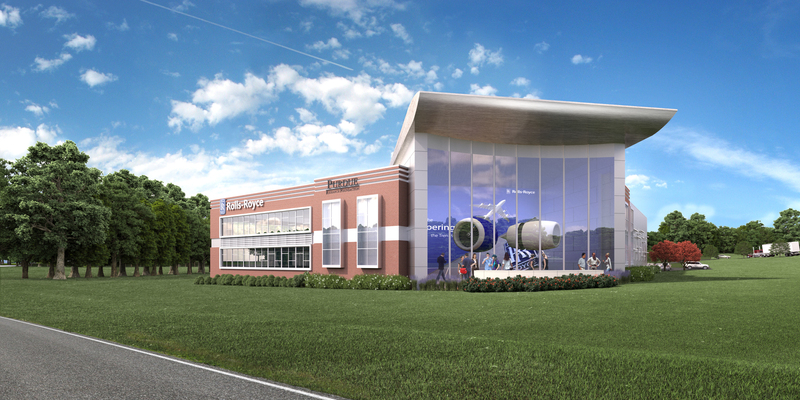 Our architects and engineers are thrilled to be a part of the recently announced new 50,000-sft facility that will house a research and development team for Rolls-Royce at the Purdue University Research Park Aerospace District in West Lafayette, Indiana. American Structurepoint, in design collaboration with the Purdue Research Foundation (PRF), is providing architectural, structural, and interior design services for the first new facility in the aerospace district. The building also will feature incubator space for other companies interested in aerospace and aviation development. Purdue Research Foundation will own the building and lease a majority of the space to Rolls-Royce, which plans to develop and test jet engine components there and collaborate with Purdue researchers through corporate partnerships. Our building design sets out to merge the ideals of two worlds into one dramatic statement – the university academic setting and the high-tech nature of research and design. Through the use of brick, metal panels, and glass, an aesthetic merging these two ideas is born. A curved glass wall with a wing-shaped roof that joins these two worlds harmoniously reveals a two-story lobby/atrium that will display graphics and jet engines for Rolls-Royce. We also wanted to create a space that promotes collaboration and innovation among all who will work and research there. Our design vision also strives to position the facility as an inviting gateway to the research park and create a high standard for future economic development in the area. We join with the PRF in bringing this vision to life, and we foresee this as only the beginning for great things to come to the aerospace district and for the entire State Street Redevelopment project in West Lafayette.